Pakistan, a year back, introduced a lucrative auto policy that resulted in investment announcements from some of the biggest brands in the world, including giants like Renault, Volkswagen, and many others. The policy not only ensured incentives for newcomers but has also motivated Dewan Group to get back into the auto sector. Muhammad Saleem Baig, CEO of Daehan Dewan Motor Company, in an exclusive interview with ProPakistani, shared the story of ups and downs of Dewan Group and how it plans to re-conquer Pakistani market with its experience, local network, and proven quality. For those who don’t know, Yousaf Dewan Group of Companies stepped into automobile industry back in 1998/1999 as a result of an agreement with Hyundai and Kia. In fact, YDC was the reason that Hyundai and Kia vehicles became a local success. The company, later on, introduced the well-known Hyundai made Shehzore truck, which became an instant success. Saleem Baig told me that company sold over 50,000 Shehzore trucks, a number that has still not been surpassed by any truck maker in the country. At the time, Shehzore held a market share of 80% in one tonne pickup category 20% market share in 1 liter hatchback category. This accounted for an overall 10% market share in auto sector at that time. However, in 2010, Hyundai decided to halt its operations in 18 countries throughout the world — including Pakistan — due to a shift in the company’s business dynamics. The move isolated Dewan Group and it went into incognito mode while it searched for its next partner. Saleem Baig mentioned that apart from Kia and Hyundai, YDC also brought BMW to Pakistan and has already signed a distribution agreement with Scania, company based out of Sweden, for manufacturing buses and trucks in Pakistan. After Hyundai left the Pakistani market, Dewan Motors was left with just a few leftover kits for Shehzore vehicles. This is when the company started to look around for sourcing the rest of the parts. The company had many proposals from several Chinese automakers which were considered for evaluation. 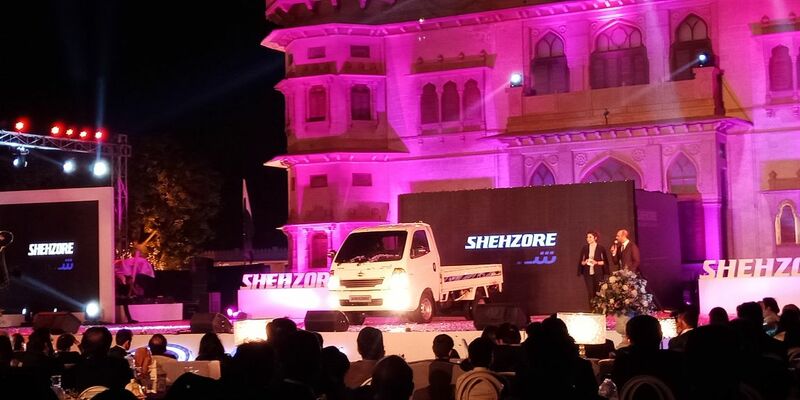 Saleem Baig said that they tested a few Chinese models of Shehzore but their performance was below par. Shehzore gave an engine performance that lasted 300,000 kilometers, however, the Chinese models only went as far as 50,000 km which wasn’t acceptable for Dewan Motors. Dewan recognized itself as the provider of a quality product with good after-sale value and spare parts that were readily and cheaply available. The CEO added that Dewan Motors stuck to its vision of providing quality products so instead of going to Chinese manufacturers out of desperation, they waited for better options. The quality and after sale service is very important for us. Giving the quality product in the market is very critical. The company will also enter the passenger cars market in the near future by bringing SsangYong to Pakistan, keep reading to know more details on this. It is apparent that Korea has established an identity as a provider of good machines, be it the electronics or mechanical systems. In fact, many consider Korean products to be of same quality as those of Japan. So, Dewan went to Korea to look for quality products. They were directed to meet with the Kolao Group of KR Motors. The Kolao Group also owns the Daehan brand. The company has a 1-ton pickup, 2.5-ton pickup in the making and another double-cabin pickup in market circulation. This is where the Dewans leaned that Kolao Group had already invested $10-$15 million on a new 7% bigger model of Shehzore like trucks. SaleemBaig highlighted that Shehzore was built around the Korean power train technology including the all important rear axle, that looked even better than the original Shehzore that Dewan group sold over 10 years ago. Dewan Motors was quick to pitch their plan. With Kolao group’s tech and Dewan’s network of dealers, market share, and a state-of-the-art assembly plant in Pakistan, both the companies had the perfect chance to form a joint-venture with 50-50 ownership to give birth to a new company called Daehan Dewan Motor Company. With the deal locked with Kolao group, the Dewan group invested several million dollars to revive its assembly plant in Pakistan; that enabled the company to start assembling Shehzore trucks in the country again. The investment from Dewan includes progressive localization of the vehicle in Pakistan. The first Shehzore produced had a localization of around 20%. Dewan also holds the vision to localize the manufacturing to create more employment opportunities in the process. Dewan Motors has an established plant in Sindh with over 500 employees. The company’s CEO told us that it is a technologically advanced plant with four robots that paint the vehicles. He added that these robots were brought from Germany in 2000 and even after 18 years there is no other company in Pakistan that has robots at their plants. Talking about the capacity, he added that a total of 20,000 units can be assembled per annum at the plant. The capacity will be increased once SsangYong vehicles are introduced and localized in Pakistan. Muhammad SaleemBaig said that Shehzore’s success in the market was mainly due to its exceptional quality and resale value, and that is exactly what they are going to focus this time around as well. Shehzore had 18 3S dealers, which is one of the biggest networks in Pakistan. Dewan took them into confidence before relaunching the Shehzore and most of them are in good faith with the company. CEO told that the lack of dealers and parts is why the Chinese are yet to make a mark in the market. On the other hand, Dewan already has 12 dealers in place with many of them with the 3S status. Currently, there are no 3S dealership centers in Karachi,however the company has established a state of the art product support centre. Apart from that, the company will invest more capital in the development of 3S dealers so the below-mentioned SUV launch can be successful as well. Hyundai and Dewan, as mentioned earlier, once held an overall market share of 10%, however, since then the market and consumer demands have changed. Without a doubt, Dewan would’ve to bring in more options other than commercial vehicles to gain even half of the share they once held. The company told that early next year they will bring SsangYong to Pakistan. The aim of the launch will be to provide quality vehicles at a competitive price – High Value Proposition. Dewan insisted that they would never compromise on the quality as it is the company’s unique selling point. ProPakistani inquired about the price range of these vehicles as well. The company responded that the B-segment SUVs will be priced in the B passenger car segment. The C-segment SUV will be launched in C passenger car segment price range, which will be around what the top end Honda Civic and Toyota Corolla cost. So, Pakistanis will be getting an SUV at the price of a Sedan. The E-segment SUV, if launched, will compete directly with Toyota Fortuner. The company also gave a rough estimate of how much the Tivoli model will cost. They added that the Tivoli SUV will be priced around Rs 2 million – which seems pretty reasonable considering all the features that the company is promising. The demand is already there, currently, the companies sell around 300,000 units annually. The number will go as high as 500,000 by 2021 as country’s young population is increasing. The company recognizes the low-priced market sector, however, has no plans of launching any models under Rs 1 million,but may venture into electric/hybrid vehicles in the near future. The policy has generated competition, this is good, the market is growing. The size of the cake is growing, everybody will be a winner, nobody will die. Chinese will have their own share, the Korean players are coming, they will have their own shares. We will have our own share, I believe no threat to the Japs, they already have expansion plans, they are coming up with new products. So, ultimately more choice, cake size growing will create employment in Pakistan. Its a win-win situation. The CEO also made a few recommendations regarding the policy. He added that the government should maintain and continue the policy so foreign companies continue to invest in Pakistan. On a question about taxes, the CEO added that any changes in the policy would hamper the investment. The companies have already aligned their system with the existing tax regime, and any changes would mean the change in company’s plans which might, then, hesitate in investing. On a final message to the customers and the general public, Dewan Motors ensured that their vehicles are of the best possible quality. The company waited 7 years to get the best manufacturer when they could’ve easily gone for Chinese manufactures and compromised the quality. We have launched the best possible product – a very high-quality product and we will be launching other products. We believe Korean products and Korean technology have advantages and we will be offering this to our customers. Do Electric Vehicles Have a Future in Pakistan?